Police respond to Thursday morning's active shooter situation in downtown Cincinnati. 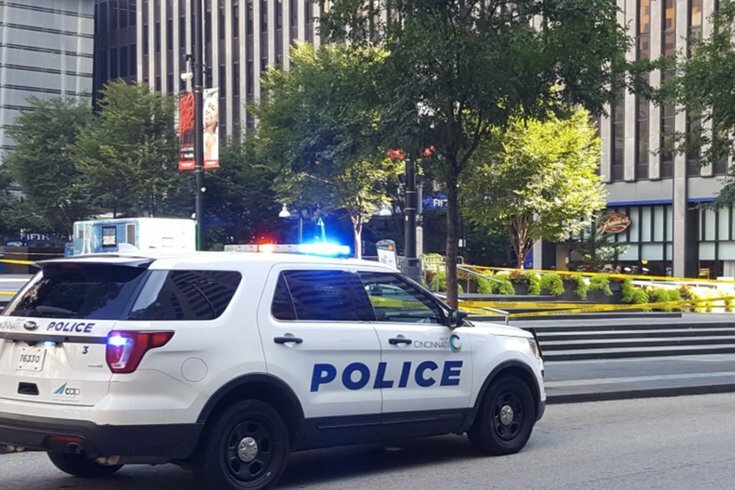 Three people were killed and five others were injured in downtown Cincinnati on Thursday morning by a person who opened fire at a bank building, according to police. The suspect is dead, said police, who tweeted that three or four officers responded to the scene at the Fifth Third Bank and engaged the shooter. It was unclear if police counted the suspect among the fatalities. The shooting occurred in the bank and loading dock. In an tweet, police reported an “active shooter/officer involved shooting incident.” The situation appeared to be under control just before 10 a.m.
Police had said multiple people were transported to an area hospital. Their conditions were not immediately known, nor was it clear if the shooter was one of them. People in the vicinity of the building said they heard a series of gunshots, media outlets reported. A spokeswoman for Fifth Third Bancorp says the company will comment later, the Associated Press reported. A police news conference was planned for Thursday morning.